This Grilled Cajun Chicken Salad with Creamy Cajun Dressing is one of my all-time favorite main dish dinner salads! It's got plenty of protein from the spicy grilled Cajun chicken, and a homemade creamy Cajun dressing to help tone down the heat just a bit. And the crisp cucumbers, juicy tomatoes, and creamy avocado are just the thing for a warm summer evening meal! Prepare the salad components by washing and drying the vegetables, then slicing the cucumbers into thin discs, cutting the grape tomatoes in half, and slicing the onion into thin strips. Wait to peel and slice the avocado until just before serving. Prepare the creamy Cajun salad dressing by processing all of the dressing ingredients together in a blender or food processor until completely combined. I would recommend starting with 1 teaspoon of Cajun seasoning and increasing the amount until you reach your desired level of heat. Refrigerate for 20 minutes before serving. Heat grill to medium-high heat. Place the chicken breasts on a baking sheet or large dish and pat dry. Drizzle lightly with olive oil and rub the chicken to coat evenly. Sprinkle 1/2 teaspoon of the Cajun seasoning over the top of each chicken breast, turn the chicken over and sprinkle each chicken breast with another 1/2 teaspoon of Cajun seasoning so the chicken is evenly coated on both sides. Prepare each salad plate by dividing the lettuce between four large plates. 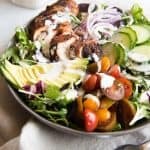 Arrange the tomatoes, onions, cucumbers, and avocado on top of the lettuce, then slice each chicken breast into strips and arrange on top of each salad. Serve with Creamy Cajun Dressing. You can either use a Cajun seasoning blend from the store or make a double batch of my favorite homemade Cajun seasoning spice blend with ingredients you likely already have in your pantry.